Starting today, over the next two weeks we’ll be republishing our 14 most-read posts/blogs of the year to date. Reviewing the list, what strikes most is the extent to which that new prophet and counter-cultural phenomenon of the year, Jordan Peterson, features in it. Virtually unheard of before he rejected the mandatory use of gender-neutral pronouns, on the grounds of free speech, back in 2016 (much to the fury of radical transgender activists), today he is an international household name. More on the pronoun warrior who’s since taken his fight against post-modernism round the world in the days to come. But today, our 14th most-read post of the year features the BBC, an institution that now more often closes down debate than opens it up in pursuit of its own Leftist agenda. Nothing was more illustrative of the biased BBC’s journalism than its whitewashing of Brendan Cox, which David Keighley documented in a post for us on February 20, 2018. It is not known precisely what Brendan Cox, the widower of murdered MP Jo Cox, did wrongly to women while he was employed by Save the Children. Mr Cox, who had been director of strategy for the charity, resigned in 2015 while an inquiry into the allegations against him was in progress, and proceedings were terminated before the facts could be established. Belatedly, he has now accepted that he ‘crossed a line’, and in recognition of that he has resigned from the two charities he founded in memory of the tragic Ms Cox after her death in 2016. Some of those who know Mr Cox, including his in-laws and Daily Mail commentator Amanda Platell are standing by him, because they say he is a dedicated family man, looking after two vulnerable children, who has painfully seen the error of his ways. The purpose of this blog is not to attack Mr Cox for his morality or propriety without the full facts being known. In the #MeToo era, far too much effort is being expended on name-calling and rushing to judgments about the behaviours of people – especially men – without the facts being known except through the often unreliable, distorted lens of the media. What Mr Cox’s resignations have thrown into focus, however, is the appalling bias in the BBC’s coverage of the whole Jo Cox saga. Her death in the days leading up to the EU referendum was shockingly violent. But in the BBC’s book, she instantly became a martyr of Right-wing bigotry, even though her killer, Thomas Mair, was arguably mentally deranged. 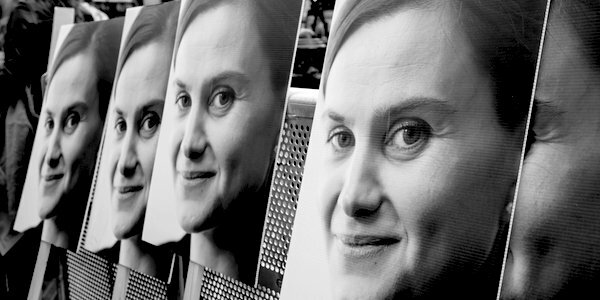 The Jo Cox label instantly became a BBC dog-whistle fulcrum to bring on a raft of people – including especially Brendan Cox himself – who wanted to attack those who were perceived to be against her saint-like espousal of causes such as open immigration, Remain (in the EU), and cultural diversity. Airbrushed out of the equation from day one in the BBC coverage was that Ms Cox – far from being a saint – was strongly anti-Israeli and a staunch supporter of the Palestinian cause, despite it being heavily tainted by the stench of Hezbollah terrorism. She had first pursued such views while head of strategy at Oxfam and was advocating the potentially crippling Boycott, Divestments and Sanctions (BDS) agenda against Israel. Evidence for the massive volume of unqualified pro-Jo Cox coverage on the BBC can be found by simply typing Jo Cox into the website search engine. Typical was in June last year after the General Election when Mr Cox was quoted as saying on the Today programme that Ms Cox would have been ‘hugely excited’ by Labour’s performance and that it showed her murder had ‘failed in its aim to push people apart’ (referring, of course, to the dog-whistle tag above). Moving up to date, it was astonishing in this context that the Andrew Marr Show on Sunday failed to consider in any detail Mr Cox’s fall from grace and the implications for the Cox causes. The story of his resignation, a good old-fashioned newspaper scoop, was emblazoned across page one of the Mail on Sunday, but it was not mentioned in the Marr newspaper review. Mr Marr said simply that he was ‘sad’ for Mr Cox. The reason for the omission? Editor Rob Burley claimed it was that the guest newspaper reviewers did not think it worth mentioning because allegations against Mr Cox had already been made the previous week. Excuse me? The editor of any BBC programme is responsible for his output and he must have known the enormous relevance and public interest attached to the news. His decision not to cover the story suggests the deliberate ignoring of developments that went against the pro-Cox BBC narrative. That suspicion is amplified by the BBC website’s handling of the resignations of Mr Cox. Its headline was simply ‘Murdered MP’s widower Brendan Cox quits charities’. In other words, ‘move along there, nothing to see’. In the BBC’s carefully-crafted liberal-values world, the importance of the Jo Cox symbolism is undiminished. This BBC reluctance to cover stories which go against an overall pro-Labour and associated dog-whistle causes was also on display in another aspect of the BBC news agenda at the weekend. One item widely covered elsewhere in the mainstream media was conspicuous by its absence: the sensational claims by a former Czech secret police operative that Jeremy Corbyn, or ‘COB’ as he was allegedly known in the spying world, had been paid for giving information to (then) enemy powers. It is important to point out that Labour and Mr Corbyn strongly deny the allegations, but such claims about a would-be Prime Minister are of grave importance. As Stephen Glover has lucidly pointed out in the Daily Mail, had there been allegations that Theresa May met leaders of apartheid in South Africa in the 1980s, it’s hard to believe that the BBC would not have gone to town – as they have also with every claim about the alleged Russian links of Donald Trump. But when it comes to Labour? Barely a squeak. Craig Byers of Is the BBC biased blog spot has done some excellent sleuthing on BBC ‘coverage’ of the Corbyn Czech story. The BBC might have not bothered – they have made it very clear that they think they are dealing with moonshine.